The Million Dollar Case Study continues this week with our session on importing. And who better to join us than Philip von Mecklenburg-Blumenthal, Senior Director Marketplace at Freightos. And when you want to learn about freight, importing from China, and shipping, there isn’t a more appropriate person to learn from. After 15 years in the freight industry, incuding a PhD thesis on ocean freights, you can trust that Philip knows his stuff! The best part is that he broke everything down into easily understandable content, even for those who are just addressing their first experience importing their product. So the key takeaway from the session is Philip’s reassurance – shipping is actually not that complicated… until you start taking in too much information and complicating it. A lot of it is common sense, and there are resources and guides to help you through the process. Freightos is a marketplace and comparison site for freight forwarders. Like Kayak for freight forwarders. Simply enter some key information about your shipment: what your shipment is, the volume, weight, from and to destinations, and get your hands on a range of different quotes. 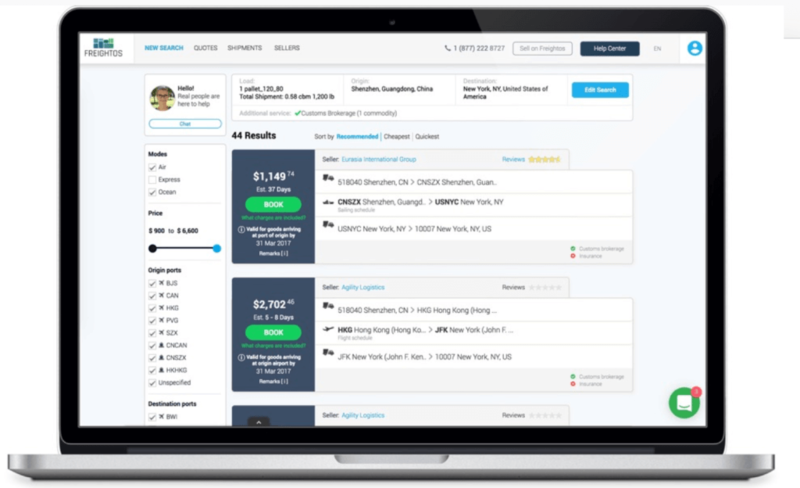 Once you enter that info, you are connected with a variety of rate quotes from freight forwarders, making this part of the task much simpler and quicker. Freight forwarders are like travel agents for your product. They arrange the transportation, the paperwork, the forms and whatever else you need to get your product from Point A to Point B. Before you start down the road of looking into importing your product, you have to ask yourself some basic questions. Namely, can this be shipped?! There are some products that have special restrictions on importing, or restrictions from Customs and Border Protection, or other international agencies. Before going too far into any details, let’s get an understanding of the common shipping terms used. In shipping parlance, these are known as “Incoterms”, which are the trade terms published by the International Chamber of Commerce and used universally in trade contracts. This is where confusion can cloud over the whole process. Thankfully, Philip pulled out just the few that are most important to us as Amazon sellers. These are international standards for who is paying for the freight, and who is taking on the risk of the shipment. This means that the factory is only responsible for getting the goods out of the factory. The supplier is not responsible for loading the goods on the transport vehicle, getting the goods to the port, or anything beyond making the product and getting it out of the factory. You as the seller take on all cost and risk from the moment it is out of the factory. EXW will generally mean that you pay more in additional fees. The factory will assume responsibility for the goods all the way through getting the products to the port of shipment. You as the seller assume costs and responsibilities from this point. FOB still requires that you as the seller clear the goods for export. The factory has complete all responsibilities at the country of import (for us, this would be the United States). The factory would pay for all costs and liabilities associated with shipping to the destination country, but you as the seller are responsible for duties, taxes, and other fees related to final clearance. This means that the factory is responsible for all costs and liabilities of getting the goods to the country of import, with all duties, taxes, and other fees paid for and cleared for import. Philip’s important recommendation here is to pay close attention to the terms of shipping that are used when negotiating prices with your factory. For example, if your factory offers to cut the sales price but changes incoterms, you may not actually have negotiated a better price in the end. So make sure that you consider all of these terms to calculate your landed cost before you agree to pricing with your supplier. Also, it is recommended to ask for FOB. Why? If you get FOB, you can get control of the shipment and don’t have to rely on your supplier as much in the importing process. Unnecessarily bulky packaging can cost you a lot if it takes up a lot of extra weight and space. A key recurring theme is to make your shipment as efficient as possible, otherwise you end up with increased time or costs. One other way to save on shipping is to palletize the shipment after your goods have cleared US customs. This allows you to save space, and therefore time and money. And lastly, work with your supplier and freight forwarder to confirm that you have properly labeled and marked your shipments. So now we come to the question of which method we use to transport our goods. Basically, if it is under 50 kilo or under 100 pounds, using courier is the cheapest after you account for various fees. This should take 3-5 days from door to door, assuming China to US. So for getting samples from a factory, for example, you would want to use Air Express. Ocean Freight costs roughly $0.60 cents per kilogram, though this estimate depends on whether you are ultimately getting your product to the east or west coast of the US. You will have some additional fixed costs for transportation and delivery costs, as well as customs fees. The nice thing though is that even if you double the weight of your shipment, your costs wont’ go up very much. This is especially true if you are paying for a whole container—your prices won’t vary much based on the weight. Shipment value – this refers to the value of the goods that you as the seller paid for them. Not how much you are selling the goods for. Philip highly recommends getting cargo insurance for your shipment. 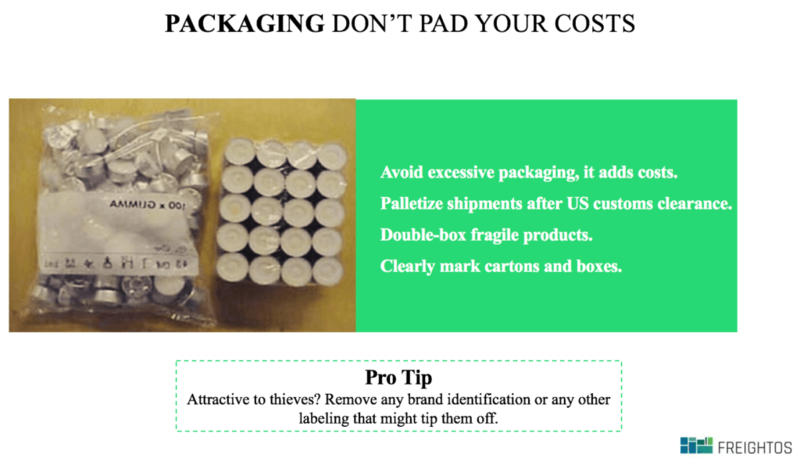 It will cost about $0.60 cents for every $100, but will cover you if anything in your shipment is damaged, stolen, or lost. So seriously consider comprehensive cargo insurance, which it will keep you covered. A small additional investment, but worth the outlay in spend. Philip says to expect 10 to 20 documents to fill out, if you are shipping by ocean freight. If you are working with a freight forwarder, they can explain everything here in detail. Commercial Invoice – This is the invoice you get from the factory, lists the value of the goods, the invoice you have to pay, and who’s selling it (the factory to you). This commercial invoice is needed at least 48 hours prior to the departure of the goods from port, so you want to have this prepared to avoid any hold ups. Packing list – The packing list is simply a list of what is in the container and what is items being shipped. You want to review this carefully (it will come from your factory). If there is any mistake, you need to go back to factory to get it fixed asap. 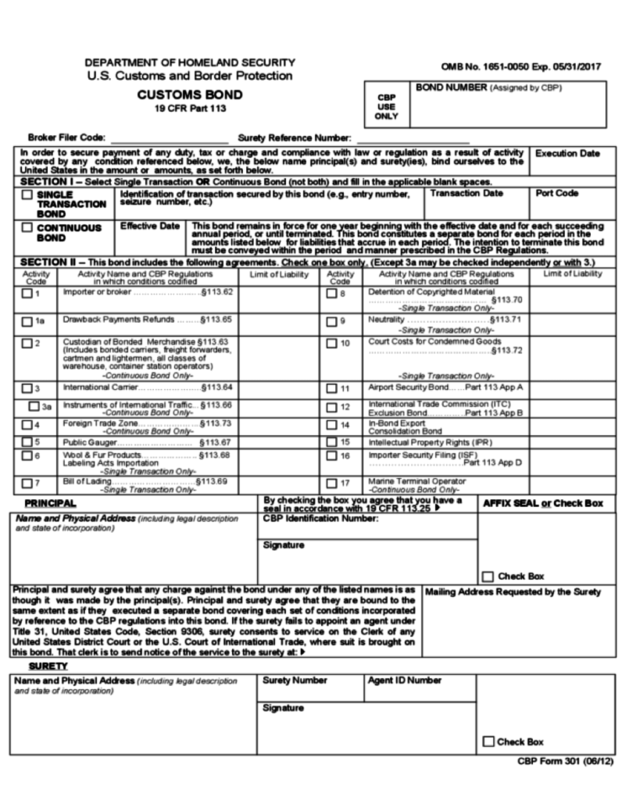 Material Safety Data Sheet (MSDS) – This form is only needed when you have hazardous goods, anything with explosives, batteries….the details matter here! Power of Attorney – This is a form you receive from the freight forwarder, in which you complete and give to the freight forwarder. The Power of Attorney is needed to eventually clear customs. The key takeaway from these forms is that you want to thoroughly review the documents (I know, it is a lot to take in, and quite tedious! ), but even small errors like spelling can add delays or costs, so make sure to have everything lined up! A Customs Bond is required to have your goods clear US Customs for any inventory that is greater than $2000 in value. There are two common types of bonds used most frequently by Amazon sellers: a Single Entry Bond and a Continuous bond. The Continuous Entry Bond lasts for 12 months, and costs $500. You can use it as many times as you want to import your goods. If you are importing more than 4 times per year, you are better off paying the $50 0 for the continuous entry bond. A Single Entry Bond is $125 to use for a single shipment. Fill it out once, use it, and get your single shipment cleared. When you are coordinating a variety parties and working in international importing, Philip recommends always adding in an extra buffer to finally get your delivery. There is always a chance that something can go wrong or a hold up occurs somewhere. If you are shipping to multiple locations, consider consolidating the shipments in China, send to one port, and then have your forwarder split and deliver separately once it has cleared US Customs. And if you are ultimately delivering your products to Amazon’s warehouses, make sure to mention that to your freight forwarder, as there are specifications for an Amazon shipment that they should know about (ie how pallets are built, setting up an appointment with Amazon’s warehouses, etc). This webinar just scratches the surface of the details of shipping your product from China. Next week the Million Dollar Case Study continues with some insights on leveraging Amazon’s platforms to launch your product. We have Joel Lentz from the Amazon Business Development team join us! Firstly, thank you for providing these free resources that first time sellers, like me, are able to learn from. I’m already at the stage of getting quotations from suppliers in China. A couple of them have asked me if I do “CIF price or door to door price?” I honestly don’t have a clue about these terms since I’m only familiar with EXW and FOB. Do you have any idea how these prices work? Appreciate your kind advise on this query. Thanks. CIF means “cost and insurance freight” and I think this is usually to the destination port. FOB “free on board” is where the supplier ships the goods to the port in China, and then your freight forwarder takes over from there. Usually, for all ocean shipments, we always go with FOB and have a reliable freight forwarder handle the ocean freight to the destination and trucking from the port to Amazon’s door. CIF has more chance of things going wrong, such as duties and customs, delays or insurance issues. I’d recommend using air freight for small shipments (door to door from the supplier to Amazon) and FOB ocean freight using a freight forwarder for large quantities. I am fascinated with the amount of information provided and all of these extremely useful sessions. I am still a bit confused on shipping my product from my suppliers location to myself. For the first shipment at least, I will want it shipped to my house so I can do initial inspections, make sure everything looks fine. If I am wanting to ship by air do I need to request FOB or EXW? Once I place my order with my supplier, do I then need to locate a freight forwarder on FreightOS? FOB means freight-on-board, which means it’s the cost for your manufacturer to produce the item and get it ready to ship via ocean. However, it does not include any additional costs such as duty taxes, storage, inspection fees, travel by truck or train, etc. EXW means that it’s without any of those costs, including the cost of your manufacturer to deliver the products to its shipping location. For air freight, I usually request that my manufacturer quote me for air express door-to-door. This will give you the exact costs for them to prepare, transport, ship, and deliver directly to your home (or quality control location). From there, you’ll have to pay additional costs to ship it to an Amazon FC, but those costs are usually pretty low if you use an Amazon preferred partner. You can use your own freight forwarder, for sure. It’s totally optional. I like to use one for sea shipping since they handle customs, bonds, and all the other complicated stuff that goes into ordering products via the ocean. Additionally, some manufacturers like to price the actual goods low and mark up the shipping in order to make more profit on you, so a freight forward can help you reduce costs of your product. Hi guys, I really enjoy your webminar, they are inspiring and very informative. I would have a question for you: When I ship my product from china to Amazon FBA warehouse, would I ship them to only one Amazon warehouse and they then manage the shipment depending on who’s buying the product or is it preferable to ship them to multiple amazon warehouse… let’s say in the east and in the west? When you are ready to ship your items, you will need to great a shipment plan inside of Seller Central. At this point, Amazon will actually tell you where your inventory needs to go (I think this is based on existing demand so they can fulfill customer orders quickly). So once you create a shipment plan, you will then have the information you need to pass along to your Freight Forwarder, who will split your inventory and manage trucking to the correct fulfillment centers. You can review how to set up a shipping plan in our video “How To Sell On Amazon FBA For Beginners” How To Sell On Amazon FBA For Beginners! Thank you for the great webinar. I have learned a lot! I went over to the Freightos rate calculator and entered in my information (I am only shipping about 30 units, each unit is 2 pounds). As expected it returned a number that was in the ballpark I was looking for (about 200-300$ for courier. However, when I ask for a live quote, all of the shipping companies are $950 USD or higher. That really breaks the bank and makes me confused about what to do next. Any idea why the pricing is so high with the live quotes. If you are only shipping such a small amount I would recommend using air freight. It is generally more expensive (especially at this time of year) but then you wouldn’t need a forwarder and the items will be shipped direct to Amazon’s door. Have you tried speaking with your supplier to see if they can generate some air freight quotes for you themselves? I’ve done this with my product for MDCS: Europe and it worked out pretty well. As I said, shipping this time of year unfortunately does cost more. I’ve posted a few comments across the different posts now. Thank you all for the feedback! I really appreciate this disclosure and giving back. 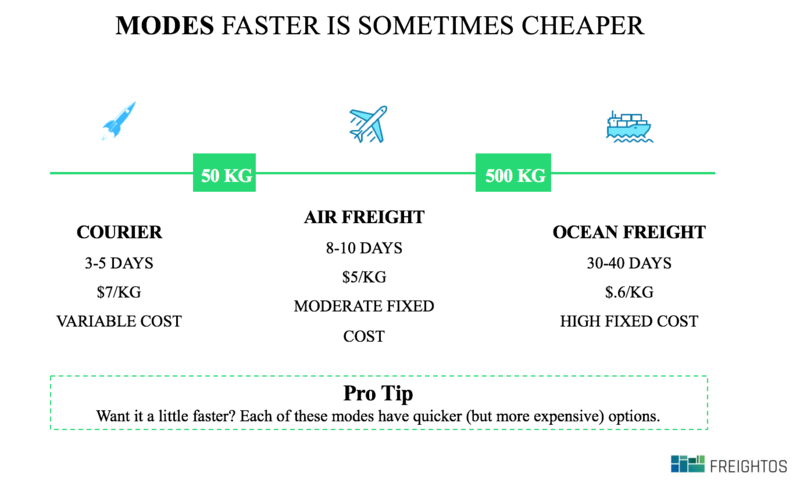 Regarding the image above that shows ocean shipping costs to be roughly 0.6/kg – What does that exactly include because the quotes I’ve received are at least twice that amount. For example, looking at 1,600kg I’ve been quoted upwards of 2,000 vs under 1,000 that 0.6/kg relates to. Im trying to find the disconnect. Have you tried getting a variety of quotes? I think this often comes down to making the right connections, which I understand can be difficult for a new seller. One tactic I have tried personally is speaking with both my supplier and/or my freight forwarder for help with getting the best shipping quotes. Also worth noting that if you are researching quotes right now then they will be more expensive in the run-up to the holiday season. I found the same when getting air freight quotes for my product for MDCS: Europe. Thank you so much Kym. Appreciate your help! You put the FNSKU on the individual packaging for the baby towel, and then when these get put in a larger box for shipping, that large box would have the same FNSKU on there ? Would there be any difference in those FNSKUs ? After you create a shipment plan inside Seller Central for your inventory, Amazon will give you the labels for your outer containers / cartons. Love your webinars! How exactly do we palletize after clearing US customs ? Are these instructions we would leave with the freight company ? After clearing customs, you can tell your FF how to palletize / re-palletize your inventory. When you create a shipment plan on Amazon Seller Central, it will tell you how many units will go to each warehouse, so you need to give this info to your FF so they know how many boxes to put on each pallet. Find out more about shipment plans in this super useful video about selling on Amazon! I’m in Australia doing US amazon wondering what the best practice is for the inspection part? I know third party inspection is touched on. Could you please elaborate on what to do if I don’t live in the US and how the cost of third parties can weight up? P.s. Forgive me if this has been asked, if I have a question like this what’s the best way to contact you guys? 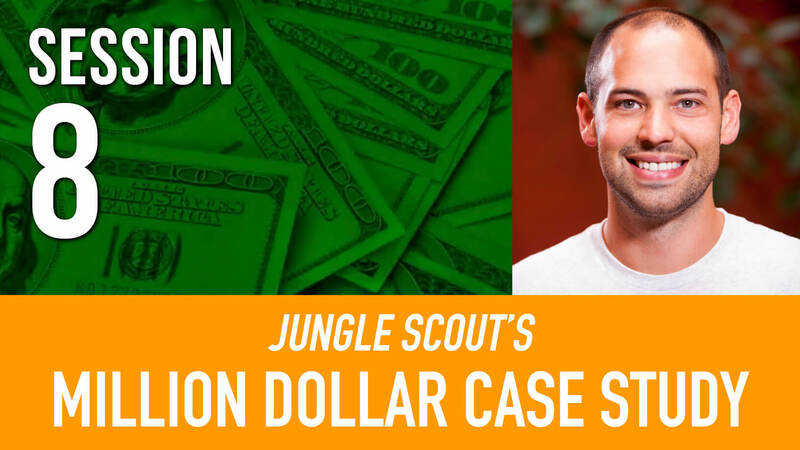 Great question – in fact, Lenny from the JS team who is also a seller from Australia covered this topic in an episode of Ask Jungle Scout which you can view here (time stamp 4:57). Lenny states that most Australian sellers just send direct from China to the US. It’s just too expensive to send it to Australia first and then to send to the US. It does make it harder. But you do have the option of getting different services in China to inspect your product before it leave there so that it gives you some piece of mind about that product. You would need to weigh up the costs of this and find a reputable inspection service. It varies depending on your product and your profit margins, so I would advise to get some quotes and then add this into your profit calculations to see how it adds up. Make sure you check out Lenny’s video! Great case study! It’s been fun following along. One thing I am curious about that I don’t think has been mentioned is how much did it cost to ship the hooded baby towels and how much was the freight forwarder? Glad that you are enjoying the case study! Really enjoying the series! Have you guys ever shipped your products to a port near your house, picked them up, then shipped them to Amazon with their discounted shipping? I live in San Francisco so I could rent a u haul and pick up my product from the Oakland sea port. That would save about $700-900 (depending on what fulfillment center I have to ship too) off im importing shipping since I wouldn’t have to pay for a truck to pick it up and deliver from the port to a fulfillment center. I would also save money because I wouldn’t need to pay amazon to move the inventory around to their various fulfillment centers. From what i understand once your forwarder ships your inventory to an Amazon fulfillment center they charge you to distribute the inventory around to their various fulfillment centers. If I shipped each box individually that would remove that cost. Could this work? I have no idea because I don’t know the pricing for shipping boxes individually vs shipping direct to amazon then paying the redistribution fee. Any advice would be very appreciated! I have never done this, and I don’t think Greg has as well. It could save you money, but how would you get the product ultimately to Amazon’s distribution centers? you will need to set up an appointment to drop off if so, and it may require more work. The additional costs you are referencing I think is the $0.30 per unit to send to a facility other than the one Amazon assigns you. So I think that fee is avoidable if you choose not to change the location that you are assigned. Hope this helps! Thank you so much for putting these webinars together; they have been a tremendous help. While understanding that a freight forwarder will walk you through the shipping/importing process, I did want to ask a generic question about what to do with your inventory once it is received in the US. Will a freight forwarder help you to get your products delivered directly to the Amazon FBA centers, or would a freight forwarder typically only ensure that your items get to port? I am wondering whether I will need to make arrangements to have them taken from the port/airport (or perhaps even pick them up myself in person). In my experience and understanding, you will specify an address in the US, and the freight forwarder will make the necessary arrangements to get your product there. You can get your Amazon Fulfillment Center address once you go through the process of listing your product in Seller Central. Hope this helps! Are they important and do one use these terms? And why did not you mention them? Do they include customs duty? Or are you then expected to pay for duties when they are delivered? As I have noticed this isn’t mentioned in either case study. Hi Osman, generally you pay that price once you have decided that you want to see a sample, and in the middle of negotiating a price for the manufactured run. It is sent Air Express (UPS, DHL, FedEx), so you don’t have to worry about customs duty. Great webinar (as usual). That being said, im still a bit hazy when it comes to Air Courier/Air Express shipping queries (China to USA). This is my first steo into FBA and I think I may have found a product. Research is going well and I’ve communicated with a factory. I’m actually in the UK so i won’t be able to receive the goods, they will arrive directly at Amazons warehouse. 1. As it’s door to door and i pay for the shipping costs while the goods are in China (after production before shipment? ), how would i then pay for any custom duties owing when the shipment arrives in the US? I’ve read a few horror stories of Amazon rejecting goods as duties were not paid. 2. Am i right in assuming i do not need to do any clearing of customs, other paperwork, or have a need for another party involved (eg. freight forwarder)? What about Importer of Record? 3. Would you know of any step by step resources online that could baby walk people through the air express, freight and ocean freight process? Ive been googling for a week and most of the information ive found is more of a general overview. Sorry if this answer is unhelpful, but it is outside of my domain, and there are people who could likely guide you with greater expertise. For example, Philip offered his contact information, and I know that Freightos has a ton of great resources on their blog, so I highly recommend you reach out to them as this is something that they do all of the time. Good luck with that! I have a question pertaining the samples shipment. I want to start with 2-3 products on Amazon at the same time, and this would require me to receive at least 6-9 samples from suppliers (at least 3 samples per each product). I was wondering if there is any chance to use Freightos to pick all the samples and deliver them in a single package? I think that would be less expensive than paying the shipment for each individual sample. You should reach out to Freightos or Philip for an answer to that, but my guess is that it would be hard, as you are sending one unit from 6-9 factories around the country. Unfortunately it may be more time and cost-effective to have it sent via Air Express, but again I would ask someone who deals with that all the time. hope that it helps. Thanks for a very informative session. I would like to ask a question regarding Freight Forwarders. Is it wise to use a Freight Forwarder that the supplier/manufacturer uses and let them arrange everything or do you engage your own? What option is better from your experience? Do you do product inspection for your import? I guess your company is doing quite bit importing? please let us know your experience. Glad that you’ve found it helpful! Yes, we will be doing an inspection before we ship the product. Stay tuned for updates on that soon!